Thank you Ken, your post is very much appreciated. Hi Colin, I didn't think they had a dam. Anyways you are right, things are dry even on Norfolk Island which is surrounded by the stuff. We ended up getting 41mm from the coastal showers last week luckily enough, even a small follow-up from a storm tomorrow would be nice. The only dams on Norfolk are property dams for stock, drinking water is tank or bore water. Oh, thanks for you post Ken. Still looks like a fairly dry period ahead, but much depends on the action out to the east. Any kind of westward movement could bring anything from onshore showers to a cyclone impact. It's a very unpredictable situation with lots of variables at play. 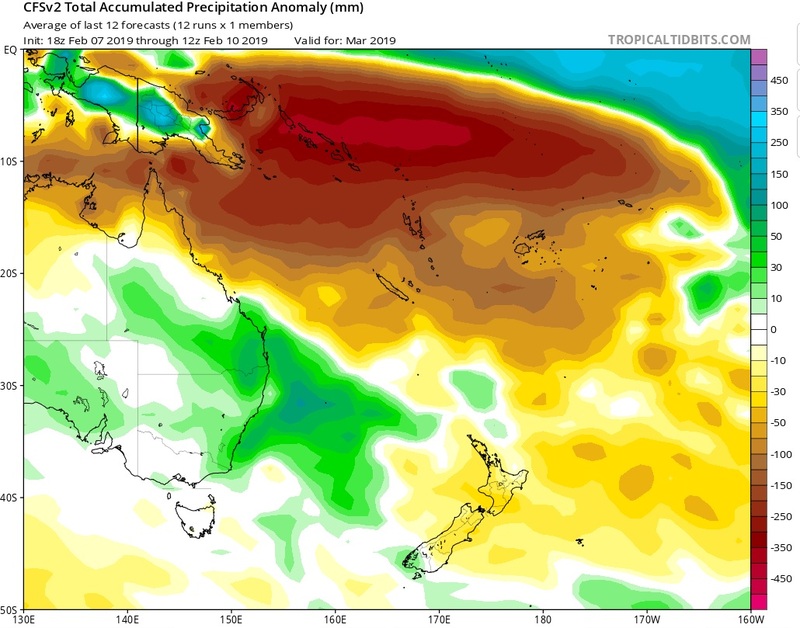 Long-range forecasts do suggest a return to wetter patterns in March. CFS monthly shows above average falls in QLD possibly from troughing and/or ECL activity. CFS weekly spreads it out fairly well across the month suggesting the LWT might become stronger in our area perhaps? The way this season has turned out I honestly wouldn't be surprised if our dry spell was ended with a major cyclone impact on SE QLD. It seems to be boom or bust across the nation at the moment with drought or powerful storms and rain events, nothing in between. Agree with that NF, and there does appear to be increasing science aligning with a hypothesized prediction that a forbidden topic on WZ may lead to wider swings of boom and bust than what we understand from past climate. I consider the outlook to be one of more extensively stressed set of conditions making it difficult to predict. Nonetheless the weather is often difficult to predict. Ken that is phenomenal satellite view of the dire situation in north west Qld. What is not immediately evident to those who don't know the area is the sheer scale of inundation on these slow moving rarely flooded major river systems in north west Qld, but when they do flood the area affected is extensive. This event is extensive for that region. Thanks for sharing, much appreciated. One can only hope of more rain, but it could be anything, really. Here is the article. Yesterday they were talking about dams so whether it is property dams or Watermill Dam on Northfolk Island which is a tourist attraction that is included, they have dried up. Refer to picture in article and you will see, I haven’t been there but would love to go. To be honest it doesn’t matter what dams they are talking about or the bores they have drilled, they are in trouble if they don’t get rain soon. Hope we all get something soon except for those who don’t want anymore right now . Looks like an awesome place to visit but maybe not right now. It is a great place, plenty of brutal history from the convict days. The first pic is the golf coarse, usually very green. The Windmill is on a small creek which always ran. I lived there for almost 2 years 89-90 and never saw it anywhere near what that article depicts. And you can't just order a truck load of water if there's nothing comin out of the ground. And you moved back to the mainland!!!!!!!!!! It looks like an awesome place. But there are all sorts of reasons why people move on. Hope it is working out well for you down in the Coastal Hinterland. Nice down there. I am kicking myself because yesterday the article was just small and stated creeks, dams and tanks. This morning the story has exploded and any inaccuracies have been changed. If I had cut and pasted the story yesterday you would understand why I wrote that especially when you have never been. There is another picture floating around but I don’t know if it is Norfolk Island of an empty property dam and it looks massive. Staying on Norfolk comes with different restrictions and becoming a resident is a major. I had a work permit, TEP, which allowed me stay for up to 3 years. Got engaged before I went out there and came back to get married. Great experience though. Been on the Goldy since 81, pretty much all of it west of the M1. The heat this morning on the Gold Coast is absolutely horrendous! We are out in the hinterland and not a breath of wind. Unimaginable what is happening this summer, warm southerlys, no storms, constant low to mid thirties. Something needs to break, and fast. This cannot go on much longer. Praying for an early winter. Thanks DD, I have heard that becoming a local in a lot of places is very hard but I didn’t realise that you needed a work permit. Wow. I didn’t want to asks because sometimes it is very personal and people don’t like to talk about it. But thanks for sharing that. I have learnt 4 new things today. 3 about Norfolk Island. The 4th was heartbreaking. While dropping my wife off to work we were listening to MMM. Dobbo was on and he used to be in the cattle industry. He knows a lot of the farmers and it is heartbreaking. Yesterday they were saying maybe 3 years to get back onto their feet, but Dobbo said seriously you are looking at least 5 years. Some of these farmers have $2 million dollar loans/overdrafts and have lost anywhere from 50% to 100% of their cattle. They were interviewing these farmers and they could not talk, they were in tears. They may never recover and as Marto and Dobbo said these are resilient and strong people. The bank may take everything or as they said the worse case scenario oversees investors just buy up everything. Meet will go up. Most of our cattle is exported and there are contracts that must be fulfilled. Sorry for harping on about this but it is heart wrenching to hear and see. Then on top of all that, farmers are going out and see what is left of their cattle struggling and they have to shoot them. This is an historical event that they stated that has never happened before regarding the cattle and the floods. As for the rain. Ken was absolutely right, if you don’t know Ken, he is not just someone behind a keyboard, he is a meteorologist, he is on the news, he is on the radio, I hear him on MMM some mornings, he knows what he is talking about, he has the qualifications, the contacts and is in the know. We were privileged to have him and I am glad he dropped in yesterday. He writes scripts that we can’t get and many of us are very grateful for. 99% of members on here are awesome but some like someone said have agendas or type some rubbish, cause a stir and ping off. This is a great forum and if we are not careful we will loose it. I have big shoulders so if you want to have a go at me for defending Ken go for it. I had no idea Ken had moved on? I admit I haven't read the forums as much lately due to uninteresting weather. Very sad to see him go, I am going to miss his regular and comprehensive contributions to the threads. He is active in the current event thread and I'm so glad he is. As old as these forums are, they still have an ignore button. It's the best way to avoid trolls, and there's plenty of them on WZ. People like Ken should not be lost to these forums due to the ignorant and rude comments of a select few. What makes a troll? With the scarcity of contributions in so-called boring weather, unless it is really nasty or outright wrong why not read it. I have seen a lot of Bom bashing om the NSW thread you know. Hey NotsohopefulPete, making general comments is not trolling. Nothing wrong when there is not much to talk about to say something like boring weather, 38°C etc etc. An "Internet troll" or "Forum Troll" is a person who posts messages to bait people to answer. Trolls often delight in sowing discord on the forums. A troll is someone who inspires flaming rhetoric, someone who is purposely provoking and pulling people into flaming discussion. One who thinks he is right and will not listen to reasoning. There is actually a good thread currently being discussed about troughing and maybe possible storms. A very good read. Nothing ignorant, or trolling to point out that the flood event, while exceptional in some locations, particularly Townsville, was not exceptional on a large scale, and did not reflect a particularly strong monsoon. 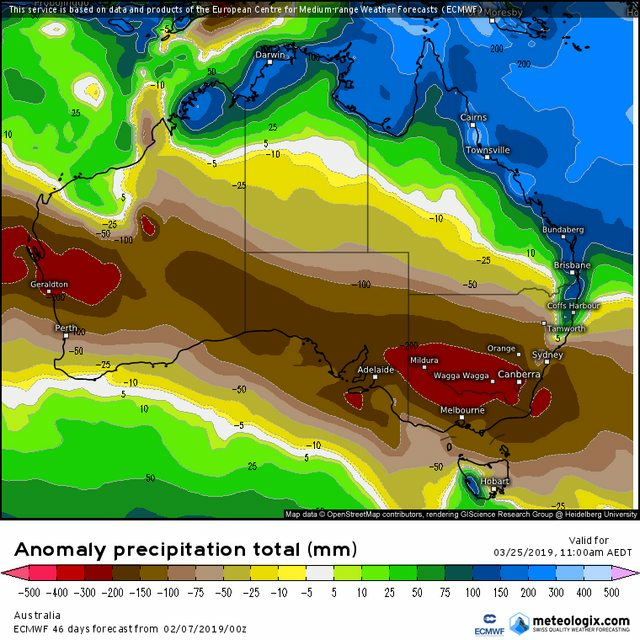 Rainfall for January for North Australia was driest in 25 years. February doesn't look a whole lot better. As for agendas, I forecast an above average monsoon due to modoki influence, so if I had an agenda it would be to talk up the amount of rain from this event, not talk it down. 1 registered (snoopydoo), 64 Guests and 2 Spiders online. Generated in 0.042 seconds in which 0.022 seconds were spent on a total of 14 queries. Zlib compression disabled.